Sometimes it is really hard to wait, but the wait has been worth it. After starting, then stopping, then hemming and hawing, sweet cherry harvest began in earnest ten days ago. It is tricky to decide when cherries are ripe. As they ripen, cherries first turn a straw color, then a pink, then a red, and finally a deep, mahogany purple. The color purple is when they finally go from good to really good. So many cherries in the stores are disappointing because they are picked red and not purple. They look enticing, but are not really flavorful. You bite them and there is just slightly sweet flatness. As they get temptingly close to being ready, it is easy to go out in the orchard and start eating. I think, “that was pretty good, we should start now!” But, pretty good isn’t the same as really good. Given that we don’t have cherries all that often – really good is what we want. And, that change from red to purple is the change from pretty good to really good. Some of these cherries are deep red and a few are purple. When I was looking at them on the tree, they all appeared purple. We started to pick. And after looking at them in the box, the hemming and hawing started… Red, not all purple. I was worrying that waiting would let the birds eat that much more of our crop. I also didn’t want to get behind and suddenly have overripe cherries. Yet, I just wasn’t satisfied with the overall flavor and color of what I was seeing in the box. My crew foreman was watching me scuff my feet, bob my head back and forth, open my mouth to say something and then close it. What was the right choice? Then Mother Nature helped me out. In the middle of all that hemming and hawing, it started to rain. Picking in the rain is miserable. We would wait. It turned out to be a good choice. The difference between that Friday and the next Monday was notable. The color had deepened and the flavor had intensified. Rather than looking in a box and wondering, I was looking in the box and liking what I saw. 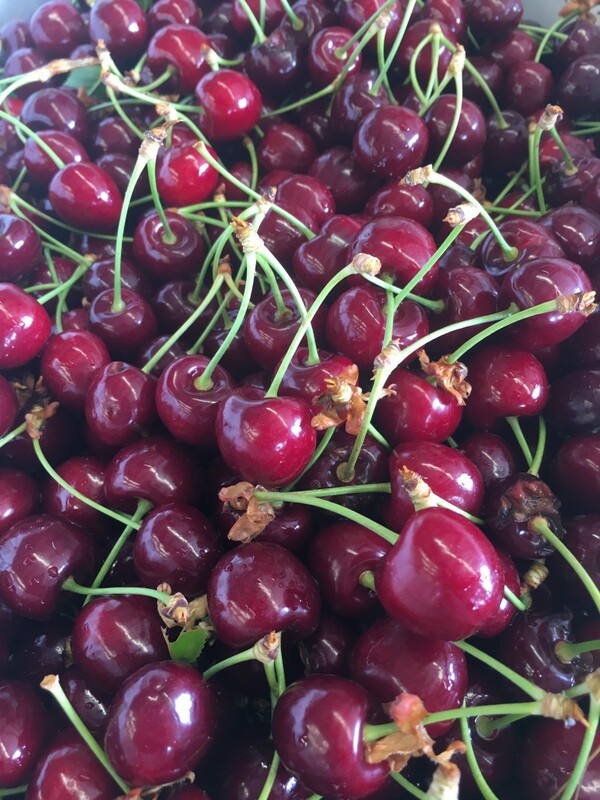 We have been picking fast and furious and will have lots of cherries at the farmers markets this coming weekend. Purple is flavor and sweet lusciousness. Red was almost but not quite. 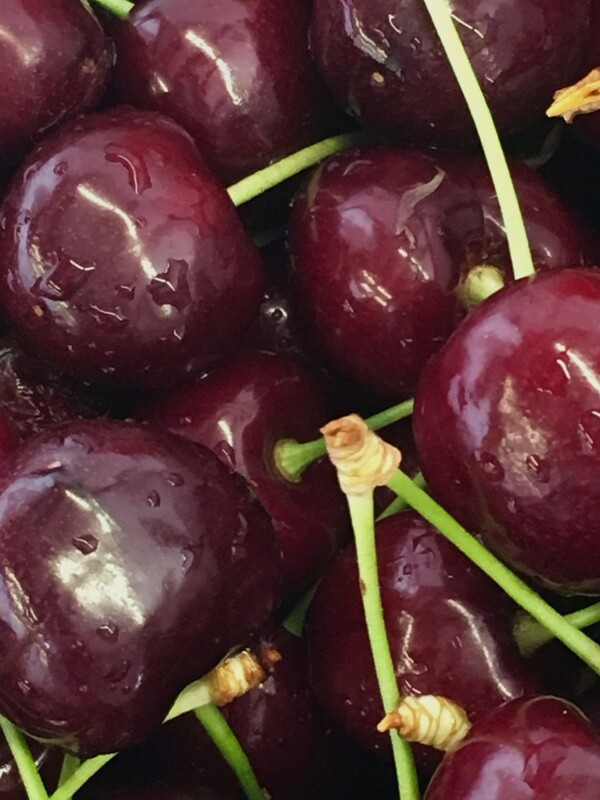 I eat enough cherries in the field that I purposely don’t keep them in the house since I would founder on them.The question now isn’t whether they are good or really good – it is how to stop eating them once I’ve started!